How to handle a crisis and keep everyone safe. CPI. This course is intended for family members who support individuals with Autism Spectrum Disorder and would like to enhance their skills in a crisis. Participants will not be certified. Families must have completed an intake with Kerry’s Place prior to registering for the course. 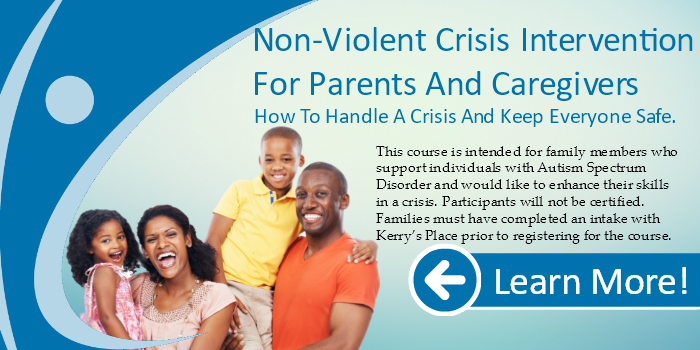 * This workshop will provide parents and caregivers with an overview of some of the concepts and strategies taught in the Nonviolent Crisis Intervention® training program that can help in the support and care of their family members at home and in the community. It may also give parents and caregivers insights into behavior patterns of their family members. The workshop includes workbooks in which participants can fill in information about their family member as they go through various program concepts. After the workshop, they’ll have take-away Action Plans filled with strategies they can begin to use immediately. *Please bring a lunch.Please wear lace up shoes with good traction. 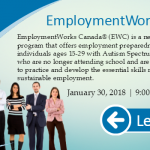 EmploymentWorks Canada® – MOVED TO AURORA!